Credible is a student loan and refinancing marketplace that offers borrowers competitive rates and a wealth of options for all their credit needs. The service does not directly provide loans, but works with an extensive network of reputable lenders to provide the best possible rates and conditions for all borrowers. Credible’s goal is to provide an unbiased view of all available options for borrowers to empower them to make the best choice. The company prides itself on charging no fees and requiring no commitments to use their service. Furthermore, Credible accepts loan applications for over 2,000 universities in the United States, and can even offer loans that cover the entire cost of attendance. With a modern approach to student loans, and outstanding customer service, Credible presents an ideal solution for those who want to weigh their options before making an important financial decision. Unlike other student loan lenders, Credible is not directly a lender, but rather a lending comparison service. This makes it an ideal service for borrowers who prefer more than one offer sheet before jumping into a long-term loan agreement. Additionally, the company’s partners provide some of the lowest interest rates—both fixed and variable—and flexible repayment terms, giving users a wide variety of choices to find a loan that will work with their financial reality and repayment capabilities. Moreover, because they offer loans that can cover the full cost of attendance, Credible is an appealing solution for students who wish to complete their studies, but might not have the means to do so without assistance. If you prefer options and are looking for some of the lowest rates in the industry, Credible might be a great choice for properly assessing your available alternatives. One area Credible has dedicated a significant amount of careful thought is its single application. Though it works with several partners to provide loans to users, Credible only requires that you fill out an application once that can be used by all lenders to determine your creditworthiness and loan terms. The initial process takes less than five minutes, and will lead to offers from different lenders that you can then evaluate to find your preferred option. Once you have chosen a lender, you will be required to provide further documentation, including admission documents, identification, and finally an e-signature. As soon as you are approved and finalize the contract with the lender chosen, funds will be automatically disbursed to your university. If you are looking for refinancing, the initial process is similar, though the application and lender selection steps take less time.Your initial application can prequalify you for better rates without requiring a hard credit pull from lenders. Credible loan providers offer amounts that range from $1,000 up to the full cost of attendance for your university, although the available amounts may vary by lender. Lenders may also examine other factors when determining your loan terms and your interest rates. However, most of Credible’s partners welcome borrowers with little or no credit history, as long as they can provide a co-signer. Lenders partners with Credible’s network offer both variable and fixed rate loans, with some even providing hybrid rates. Credible’s interest rates are some of the most competitive in the industry. The company’s lenders can provide variable rates as low as 2.87% and fixed rates starting at 3.99%. Variable rates can go up to 10.27%, while fixed rates are as high as 11.84%. Many of the lenders within the network offer discounts if you sign up for auto-pay. In some cases, the discount can take up to 0.50% off your interest rate, giving you an even more competitive rate. For refinancing, interest rates start as low as 2.55% for variable rate loans, and 3.49% for fixed rate borrowing. On the upper end, variable rates go up to 9.50%, while fixed rates top out at 9.00%. Overall, Credible’s terms and rates are versitile, making for an excellent student borrowing alternative. Additionally, it offers you the opportunity to lower your rates even further by signing up with a co-signer, or signing up for auto-pay. Loan terms vary from provider to provider, but the shortest term available from any of Credible’s partners is 5 years, while the longest possible term spans 20 years. However, there is a wide spectrum of possible terms depending on your credit needs and qualifications. While information could be more clearly displayed on the company’s website, there is a large degree of flexibility and choices offered by Credible. If you are looking for refinancing, loan terms stretch from 5 to 20 years, although it is important to note that not all partners offer the same repayment terms. All told, Credible delivers a great range of repayment terms to fit even the most modest budget, allowing you to choose a plan that will not put you in a short-term financial bind. Credible understands that it works with customers’ most sensitive financial details. As such, they take great care to protect your data. All your applications are secured and encrypted, meaning your information is stored safe throughout the entire process. Your information is also held in servers that feature industry-standard security measures such as 256-bit encryption and Secure Sockets Layering technology. The company does share your information with third parties at times, although they generally do a great job of letting you know if this is happening while promising they will never share your private information such as banking details or sensitive financial information. The degree of approachability and quality of customer service delivered by Credible was especially noteworthy. Unlike many competitors, the company offers a live chat feature to accompany their more traditional channels of communication. This makes it easier to get questions answered, and the chat is staffed by knowledgeable representatives who help with all queries promptly and with a friendly attitude. If you prefer, you can also reach Credible via telephone seven days a week during business hours, or via e-mail, with the company aiming to respond to most requests within the same business day. Additionally, Credible features an excellent FAQ section that answers most of the common questions regarding their service. In general, Credible’s service offerings are satisfying, although there are some areas where the company could improve its solutions. We would have liked to see information on loan rates and terms displayed more prominently on the company’s website. The company could add a knowledge base with articles relating to student loans and finances in general to provide a more well-rounded service to customers. More clarity relating to how Credible shares your personal details with third parties would be beneficial. One of the best parts of Credible’s service is their incredibly low rates, which are amongst the best in the industry. The simple application and matching process means getting your funds a breeze. Excellent customer support and great variety when it comes to channels of communication make Credible especially approachable. Credible places an emphasis on simplifying the student lending process. The company works with some of the best-known and most reliable loan providers in the industry, making it easy to find the right loan solution. Its loan marketplace model is impressive, working in customers’ favors by forcing lenders to offer you the most competitive rates possible to win your borrowing business. Additionally, the company does not charge any fees or spring any hidden costs on you at any point. 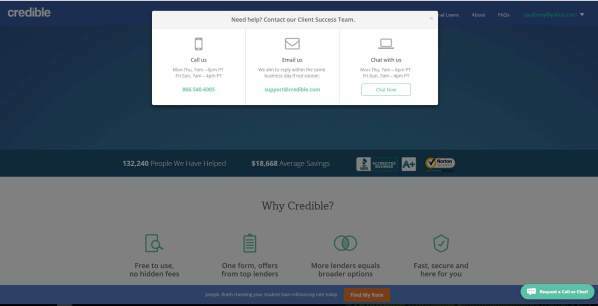 Credible is very transparent about how they make money in the lending process, and it was refreshing to see the company provide straightforward answers. Besides excellent customer service, their FAQ section also delivers all the answers you might need to fulfill basic inquiries. 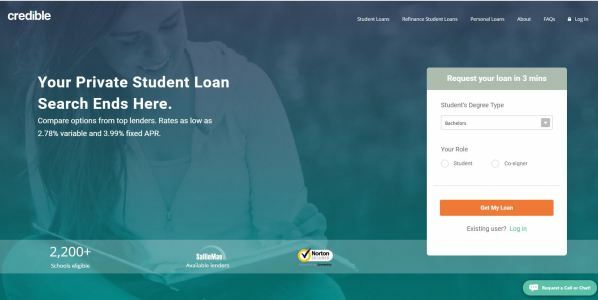 Overall, Credible offers a reliable, flexible, and outstanding service for borrowers looking to finance their degrees or refinance existing student loans.